Bidding a fond farewell to one of my favourite colours and a framelet set that I love! How I love Coastal Cabana! I'm going to miss it so much!! 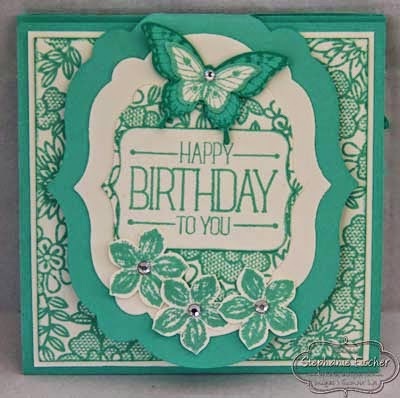 I'm also going to miss the I Love Lace background stamp and the Labels Collection framelets. However, I know I'll get over it when I see the new products! 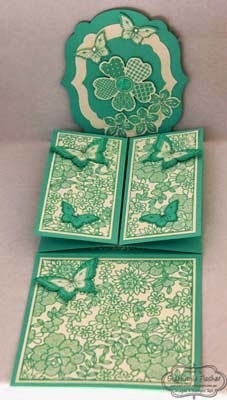 Many thanks to Dawn Griffith for the great tutorial on this triple flap fold. This card is my entry for the May Splitcoaststampers Colour Focus challenge (CCREW0515DF). Why not have some fun and play along. Visit the gallery for some great inspiration. We'd love to see your creations - share them with us by uploading your image to the Creative Crew gallery Remember to include the code CCREW0515DF in your Key Words. Last Call!, a.k.a. Going But Not Forgotten – can even be construed as ‘fading away’ – Last Call! Which In Color(s) are you going to be oh-so-sad to see retire? If we've already hear about other retirements from SU while you're creating, please feel free to include those here if you like! Focus New beginnings – fresh starts, Spring begins, birds nesting, new baby animals. Are you harboring “new to you” items from any of the cattys that you haven’t used yet? ***gaassssssp*** Bring those treasures out to play, creative peeps! Time could possibly be running out for some of those items and we might not even know it yet! Scrapbook / 3D / other than a card / giftable: going away, moving, some kind of “going/motion”, The ‘going away’ could even be construed as ‘retiring’ if you like ... just apply it to a scrap page, Project Life page, giftable, or other 3-D.
Bring It!! For what has seemed to be the ‘eternity’ Winter, we’ve been literally pacing past the wintery window panes looking & hoping & calling out for Spring! Now that it’s finally here, what are you absolutely excited about that’s coming up soon, or sure to be coming?. What are you anticipating so eagerly that needs to be shown & shared to our demo family so they can share excitement along with you? 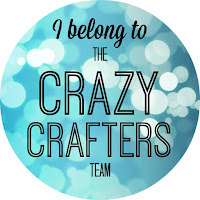 This can be any type of paper crafting project, or a card .... you’re the dreamer here! 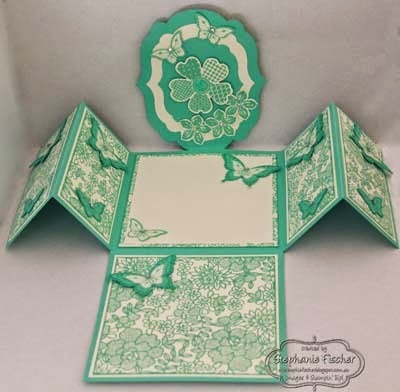 Labels: Chalk Talk, Flower Shop, I Love Lace, Label Triple Flap Card, Pansy Punch, Papillon Potpourri, Petite Petals, Retiring Products 2015, Small Butterfly Punch, Stampin' Up!